"Attention! Attention! Ladies and gentlemen, attention! There is a herd of killer rabbits headed this way and we desperately need your help!" Note: this review was originally posted a couple of months ago and has been updated below to reflect Scream Factory's recent Blu-ray release. Jaws so thoroughly altered the film landscape that it’s sometimes easy to forget that it was hardly revolutionary from a genre standpoint. Far from the first killer animal movie, it was actually more of a shot in the arm of a movement that had been flagging since its glory days, when matinee screens were dominated by giant insects, marauding birds, swarms of rats—you name it, and at least one movie probably exploited it. By the early 70s, however, it had mostly run its course—not that this stopped Hollywood from throwing considerable resources at outrageous productions nonetheless. One of my favorite, underappreciated aspects of this era (both before and after Jaws) was the studios’ willingness to often go all-out for these things by wrangling together overqualified talent to battle mutated creatures. It’s the sort of approach that leads to Ray Milland battling frogs, Ernest Borgnine falling prey to rats, Richard Harris facing down a vengeful orca, a veritable all-star team fending off killer bees in The Swarm , and Shelly Winters donning a magnificent sombrero during an encounter with a giant octopus. But arguably the height of this folly came in 1972, when MGM decided it would adapt The Year of the Angry Rabbit, Russell Bradon’s Aussie eco-horror novel that envisioned a world overrun by killer rabbits. Sensing that this might be received as a joke, the studio retitled the film from Rabbits to Night of the Lepus in the hopes that audiences would take it seriously. To further indicate its utter conviction to the premise, it tapped an impressive cast opposite its mutated creatures, a noble approach that might have given the film a fighting chance had it not been about killer rabbits. I’m not saying it’s impossible to pull off such a feat, but there’s a reason Night of the Lepus is pretty much the lone representative of this niche. To its credit, it does its best to convince with a hilariously self-serious newscast warning about the dangers of booming worldwide rabbit populations. A reporter’s deadpan voice-over delivers an ominous warning over stock footage of ranchers dealing with hordes of rabbits in an effort to build these cuddly creatures into a legitimate menace. Eventually, an actual movie begins, taking viewers to the southwest United States, where a group of ranchers (headed up by Rory Calhoun) is struggling with a rat infestation. Rather than resort to traditional methods of poison (which will leave the farmland worthless for months), they turn to Roy Bennett (Stuart Whitman), a scientist researching an alternative that involves disrupting the animals’ hormone cycles. However, when his young daughter causes a mix-up during the experiment, a rabbit with altered chemistry is released in the wild, allowing it to breed hundreds of oversized offspring capable of wreaking havoc throughout the countryside. The spirit of Bert I. Gordon is alive but perhaps not so well in Night of the Lepus, a film that does little to disavow its audience of the notion that this premise is too ridiculous to take seriously. Don’t get me wrong: it’s definitely not played for laughs, and everyone involved is at least doing their best to be terrified by giant rabbits, but it’s hard to look at the chintzy effects and not chuckle a little bit. Throughout the film, the oversized rabbits are realize via that old Gordon staple that has perfectly (and obviously) normal sized animals rampaging through miniatures, their menacing figures heightened via forced perspective. Of course, this also means that the case rarely shares the screen with the beasts, meaning Night of the Lepus is an awkward, haphazard collection of effects shots, stock footage, and reaction shots. Director William Claxton does spare audiences of the silly compositing shots that made some of Gordon’s films so infamous, but even those often brought a certain charm to those productions, something Lepus lacks at times. Which is not to say it’s without its moments, of course, revealing the flip side to a movie with such an unbelievable concept: it’s so wild that you’re bound to stumble upon something worthwhile. And indeed, Night of the Lepus finds a hop in its step on a few occasions, such as when Bennett’s kid and a friend wander off into a nearby mineshaft, where the poor girl stumbles upon the rabbits’ den and watches on in horror as a man is eaten alive right before her eyes. It’s an impressively nightmarish scene, shot as a sort of feverish flashback as poor Amanda recalls the horrific scene to her parents. Similarly unnerving is just how unflinching the carnage often is: as the rabbits start to rack up quite a body count, they litter the landscape with savagely mauled corpses that Claxton’s camera lingers upon in stark, surprising fashion. 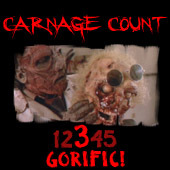 One man’s body is found by the roadside, soaked in gore, mangled beyond recognition, while an entire family of picnickers—men, women, and children—are left in a gruesome heap. These bursts of violence are striking, mean-spirited intrusions upon an otherwise harmless work that often feels like 70s TV movie-of-the-week hokum. An impressive cast does what it can to add some measure of austerity to these proceedings. Not that there’s anything wrong with this approach, but that’s pretty much all they’re expected to do: even though it grows to include the likes of Janet Leigh (as Bennett’s wife) and DeForest Kelley (as Bennett’s assistant), these aren’t exactly meaty roles, nor is anyone involved exactly looking to create memorable characters. Like so many of its contemporaries, Lepus leans on its cast to create the illusion of dignity and seriousness, even if these are mostly thankless roles (for example, Leigh spends most of the second half of the film playing damsel in distress, waiting for her husband to swoop in and rescue her). 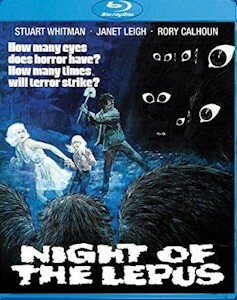 I suppose it has the desired effect in the long run because there’s definitely an air of sterile competence to the whole thing: Night of the Lepus definitely isn’t the worst version of this sort of thing, but it’s not exactly the best either. Instead, it’s content to dwell firmly in the middle of the road, unfolding sleepily with its rustic, unassuming aesthetic. Claxton’s background in TV westerns guides the proceedings, taking viewers to a dusty, folksy countryside dotted with general stores and decent folks just looking to survive this mess they’ve had foisted upon them. Nothing quite captures this sensibility quite like the climax, wherein the local sheriff and the National Guard enlist the patrons at a drive-in theater to use their headlights to corral the rabbits. When the sheriff grabs a megaphone and calmly explains that a bunch of killer rabbits are on the loose, none of the movie-goers panics or scoffs at the notion, choosing instead to dutifully form a convoy to help out. There’s a certain cozy charm in it that’s weirdly enjoyable in its gilded idealism: if nothing else, Night of the Lepus imagines a world where an outbreak of killer rabbits can easily be quelled by a bunch of good old boys and drive-in theater customers electrocuting the hell out of them with railroad tracks, and that’s something I want to believe in. Apparently, someone at Scream Factory also wants to believe, as the fan favorite cult boutique has given Night of the Lepus a Blu-ray upgrade, complete with a new 2K scan makeover and a DTS-HD MA track. Scream has also outfitted the disc with two audio commentaries: one features author Lee Gambin, while the other finds pop culture historian Russell Dyball offering his insight. A TV spot, a trailer, and a still gallery complete a pretty unbelievable package: even its most ardent fans would likely admit that they never thought Night of the Lepus would receive such a treatment. What's more, it signals the latest collaboration between Scream Factory and Warner Brothers, whose vaults are positively teeming with titles begging for similar attention.